As its summer now, we all love to paint our nails in nice and bright colour. Prevent nailpaint from chipping and get beautiful nails every day.. This is because sometimes we do not use the right techinque of applying it and also because it is so hot these days and we wash our hands several times during the day. Those who are mommies or house wives or hard workers , do so much in a day that our poor polish just starts to crack. These are some siple tips by which you can make your nail polish last long and prevent it from chipping. 1)Always wash your hands before applying nail polish. This washes away any kind of oil or any other thing that might be sitting in your nails. 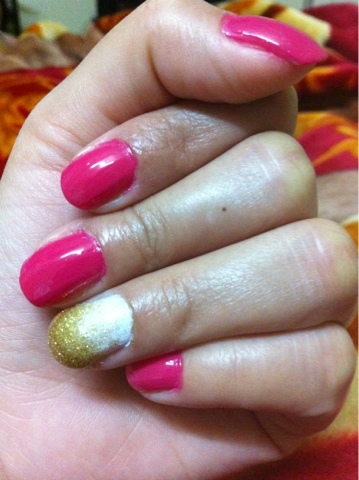 2) Make sure your nails are compleatly dry before applying nail paint. 3) Its always better to wipe off nail durface with sime nail polish remover irresepective of the fact that you have any nailpolish on or not. 4) It is always good to apply top coat and base coat. But if you do not have them then you can replace it with a clear nailpaint. 5) Always apply thin coats of nail paint. If you wish to build the colour ,then apply saveral thin coats rather than 1 thick coat. 6) Make sure that first coat is dry before applying second coat. 7) Seal nailpaint by applying a thin line across the tip of the nail sometimes. 8) If you do not have the time to dry your nail paint , dip your hands in cold water for 5-7 minutes your nailpaint will dry immediately. Hope these tips are as useful you you as they are for me. Please subscribe and comment to support my blog. I am folloing you. Great blog. very handy tips..thanks a bunch! When I had a professional manicure I noticed the technique the technician used to apply my nail polish. She first swiped the nail tips starting about half the way over the nail then she loaded the brush again and swiped from the cuticle up to the tips. That manicure lasted a long long time. Now when I try it myself it dries too fast to be able to do this. I don't know if salon nail polish takes longer to dry than store bought polish or if i'm just slow. thank you for that great tips! great tips...my nail polish never lasts very long because I have many hobbies and usually that is how I ruin every manicure I make...but taking the time to apply it right surely helps.